The only explanation for Chicago's plan to spend $100 million on an unneeded school on the northwest side is racism. Chicago Public Schools (CPS) officials say it’s to ease overcrowding at Taft high school, 6530 W Bryn Mawr, but a new building isn't needed for Taft's over-enrollment problem, and a major aspect of the proposed school is reducing the boundaries of Steinmetz high school, 3030 N. Mobile, which is under-enrolled. 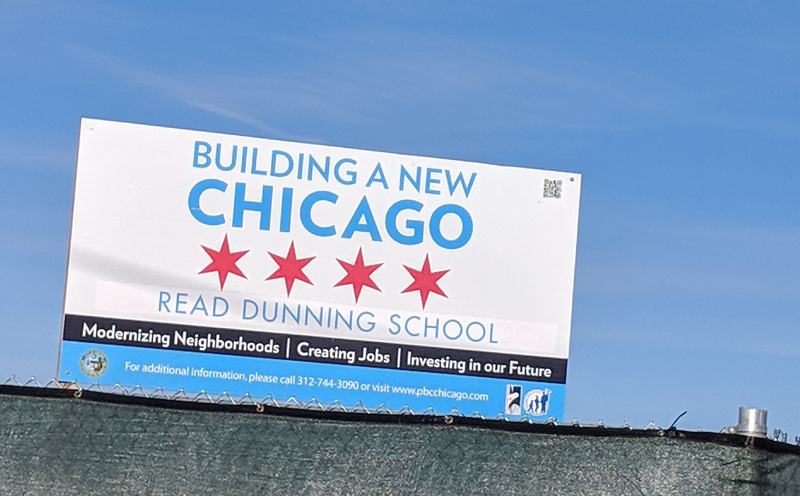 CPS says three elementary feeder schools located in Dunning, a predominately white neighborhood, will be relocated out of Steinmetz's boundaries and placed in the new school's area. 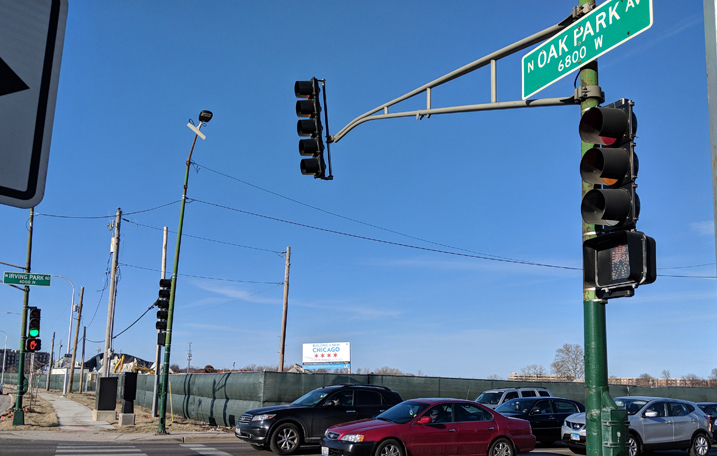 CPS says the school being built at Oak Park Ave. and Irving Park Rd. will be open in September 2019. Substance photo by Sharon Schmidt. The site of the school is 4201 N. Oak Park, 1.7 miles north of Steinmetz, which is 87 percent Hispanic and Black. The Dec. 1, 2016, CPS Supplemental Capital Budget budgets the “New Northwest Middle Grades School Construction" at $75 million; however, the final bill will exceed $100 million because of the interest payments on the borrowed money. 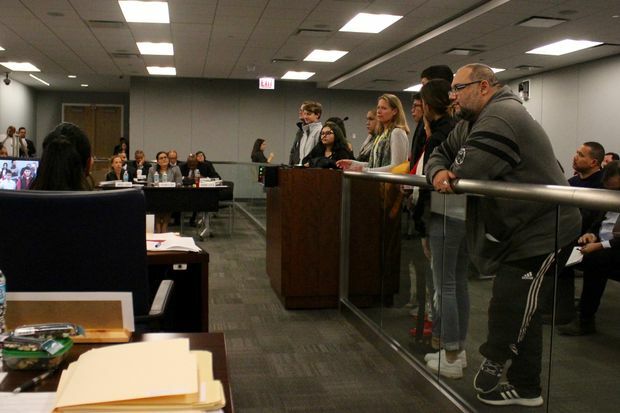 The proposed 1,200-seat school, located 2.9 miles south of Taft, will house Taft 9th graders, as well as its 7th and 8th grade selective enrollment academic center, according to CPS administrator Jimm Dispensa, who testified about the school at the Chicago Public Building Commission meeting on March 15. Dunning elementary schools – Bridge, Canty and Dever – will be moved out of Steinmetz’s attendance boundaries and put into the new school’s boundaries, subject to a Board of Education vote in the fall. About 150 current Steinmetz students live in the Dunning neighborhood. Smyser elementary will also be included in the new school’s attendance boundaries. Currently, some areas of Smyser’s boundaries feed into Taft and some into Schurz High School, 3601 N. Milwaukee. In the proposed boundaries, Schurz would lose the area. Enrollment at Schurz, like Steinmetz, has dramatically declined over the past five years. If the Board votes to reduce the Steinmetz attendance boundaries and enrollment declines, the school's budget will decrease. Steinmetz will lose more teachers, coaches, elective courses and special programs. In addition, the plan will destroy Steinmetz’s diversity by redistricting nearly all of Steinmetz’ white and Asian students. Steinmetz has 1,250 students: Asian – 3%, White – 9%, Black - 14%, Hispanic – 73%. CPS students overall: Asian - 4%, White - 10%, Black - 37%, Hispanic - 47%. 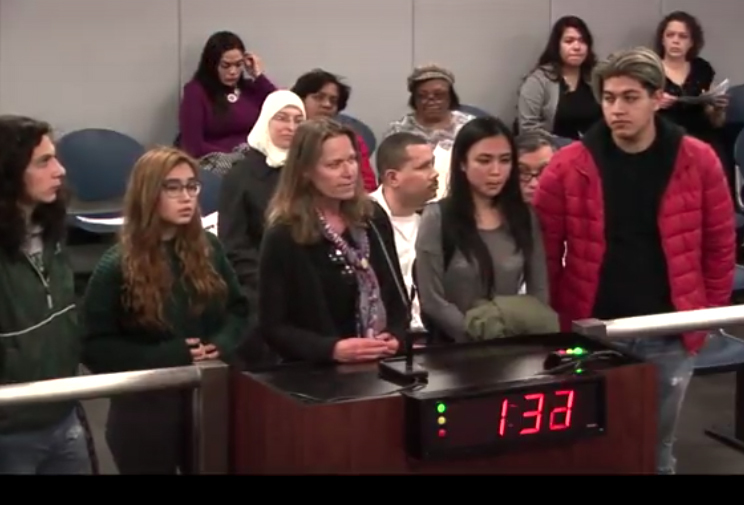 Steinmetz teachers Renato Roldan and Sharon Schmidt speak at the Jan. 26, 207, Board of Education meeting against the segregation and the huge cost that the new construction and boundaries will create. Photo by Alex Nitkin.Like Taft, which has the largest number of white students of any school in the city, a Taft South campus would also be predominately white school. After this reporter, a Steinmetz teacher, spoke at the January 2017 Board of Education meeting against the plan, saying that “instead of celebrating diversity at Steinmetz, you’re sabotaging it,” Katie M. Ellis, Deputy Chief of Staff for the Board responded with a phone call and an email. Construction work began on the site of the proposed 7-9 Taft campus at 4201 N. Oak Park Ave. in February. Workers said they have been digging out the tunnels from the previous building, the Chicago State Hospital. The April 5 Chicago Tribune story "New CPS school grounds being built on site of estimated 38,000 unmarked graves" provides some history of the site. Substance photo by Sharon Schmidt.While Board members may say they're concerned with “matters of race and equity,” $100 million in construction for a school serving mostly white students that will increase segregation is typical of this Chicago Board of Education. The July 2016 report by WBEZ “How Chicago School Construction Furthers Race and Class Segregation” shows an ongoing pattern of new construction disproportionately going to white, middle class schools, with spending justified by overcrowding, even when there are underused schools nearby. At the March 2017 Board of Education meeting, the Board members voted to start the design process for a "middle school project." Even though Steinmetz’s student body has always included hundreds of Dunning residents, the Dunning Neighborhood Organization and others in Dunning, who are outspoken in their rejection of Steinmetz, have lobbied elected officials and CPS for several years for a separate Dunning neighborhood high school. DNAinfo reporter Alex Nitkin interviews Steinmetz senior Ryan Allibone after the January 2017 Board meeting. Steinmetz students who live in Dunning, like Ryan, regularly have to defend Steinmetz when people who don't send their children there denigrate the school. Alderman Nic Sposato slandered Steinmetz at a June 2016 northwest side meeting, saying that there is no "decent school" for Dunning residents. Substance photo by Sharon Schmidt.On June 24, 2015, for example, the organization met with this reporter, a Steinmetz teacher representing the school, and State Rep. Robert Martwick at the Dunning branch library, in which Dunning residents spoke of their years of lobbying for a school. 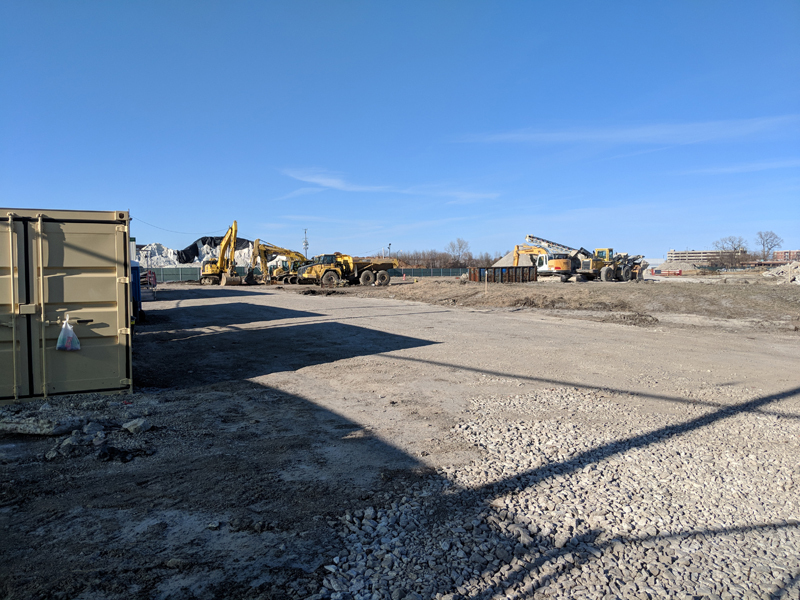 The members of the Dunning Neighborhood Organization said they were surprised to hear about the full range of academic and extracurricular offerings at Steinmetz; however, they said they were still pushing for the neighborhood high school they wanted for the Dunning community. While CPS couldn't justify a new high school for the Dunning neighborhood alone, with a total of 250 8th graders from the three feeder schools, Alderman Nicolas Sposato (38), Mayor Rahm Emanuel and Taft principal Mark Grishaber came up with the plan for a second Taft campus that would also serve the Dunning residents. 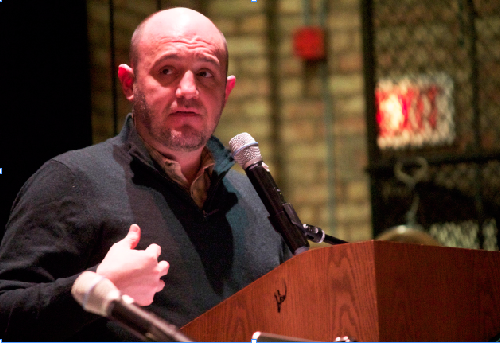 Sposato spoke about the plan at a meeting on the northwest side in June 2016, saying at that time, "There's nothing official," but that Emanuel had participated in discussions about the new school. "We're busting at the seams out here," Sposato said. "And there's no decent high school for folks to send their kids to." 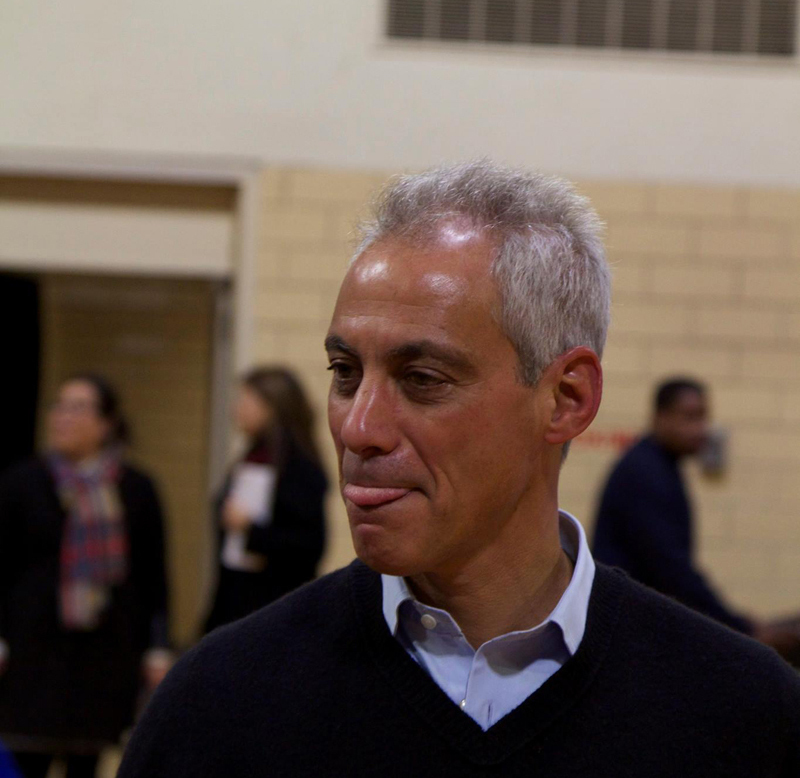 Mayor Rahm Emanuel attends a Dunning community meeting on Jan. 31, 2017, in which the proposal to build a new school is announced by Alderman Nicolas Sposato. 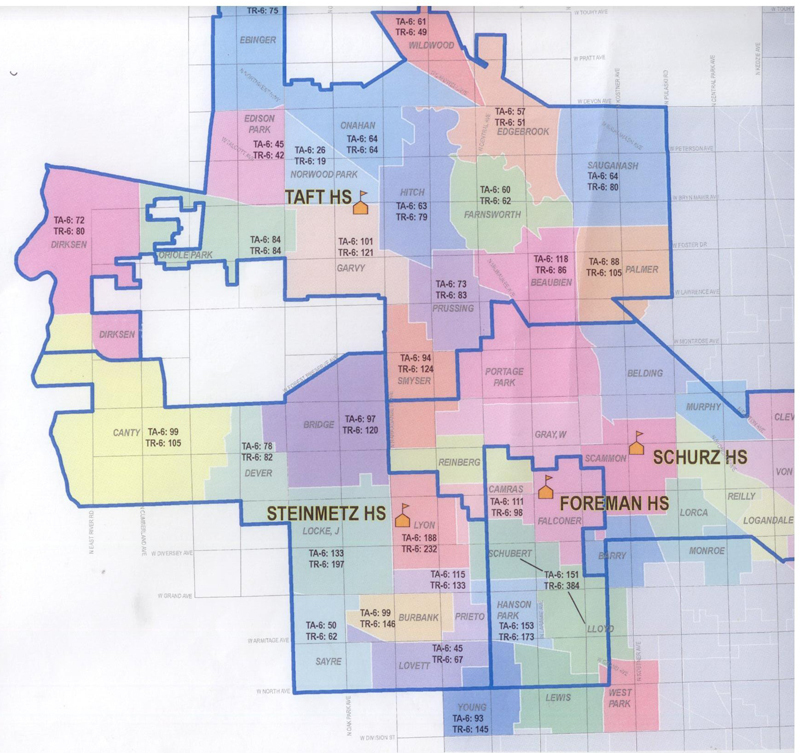 The plan calls for reducing Steinmetz high school's neighborhood boundaries. Photo by Steven Nunez. Substance has submitted a Freedom of Information Act request to CPS for the elementary schools last attended by 9th graders and 7th graders who entered Taft in September 2017. If CPS enforced neighborhood boundaries, Taft’s enrollment would decrease by hundreds of students, eliminating the need for a $75 million building (and the millions that will be paid in interest every year on the capital development loan). But CPS has continued over-enrolling Taft to justify the new school. If CPS limited enrollment at Taft by no longer enrolling out-of-neighborhood students, those students might return to their neighborhood schools. Most Chicago neighborhood schools have been steadily losing students over the past 10 years as CPS has increased school options and created new high schools. In addition to Taft, charter high schools Intrinsic, 4540 W. Belmont, and Noble ITW, 5321 W Grand, siphon neighborhood students. Northwest side students also opt for magnet high schools, like Prosser, Chicago Academy and Von Steuben, selective enrollment schools like Northside and Lane, small schools Ogden, Disney II and Alcott, military schools and art schools. In the past 10 year, while Steinmetz's enrollment decreased by 695 students and Schurz's enrollment decreased by 691, Taft’s enrollment grew by 800. Dunning residents demand "their own" high school, at a Jan. 31, 2017, community meeting. Their neighborhood high school, Steinmetz, is not overcrowded and could use investment. Photo by Steven Nunez.CPS enrolls students in Taft who live outside its attendance boundaries through applications to Taft's International Bauccelaurate program and its Navel JROTC program. Hundreds of these students are Schurz, Foreman and Steinmetz neighborhood residents. Steinmetz, Schurz and Foreman also offer IB and JROTC programs. After the mention of the new school appeared in the December 2016 Capital Budget listing, Alderman Sposato announced the "Taft South" plan at a Dunning community meeting at Merrimac Park, on Jan. 31, 2017, attended by Emanuel. Sposato presented the school plan as a “win-win,” for Dunning and Taft. When he spoke a week later at the Taft LSC meeting on Feb. 7, 2017, Sposato said the mayor was in favor of the plan. “I’ve got the mayor’s ear,” Sposato said. He and Emanuel had discussed the proposal for months, he said. Sposato also said he had been in regular talks with Taft's principal Mark Grishaber and Alderman Anthony Napolitano (41), whose ward includes Taft. Sposato, Napolitano, Grishaber and Emanuel did not contact Alderman Gilbert Villegas (36) or Steinmetz's principal Stephen Ngo during any of their planning meetings. Alderman Gilbert Villegas speaks at the Board of Education on March 21. He said that CPS should limit enrollment at Taft and invest in Steinmetz. Substance photo by Sharon Schmidt.“I went to the [Jan. 31, 2017, Dunning community] meeting to find out what the hell was going on,” Villegas said at the February 2017 Steinmetz LSC meeting. 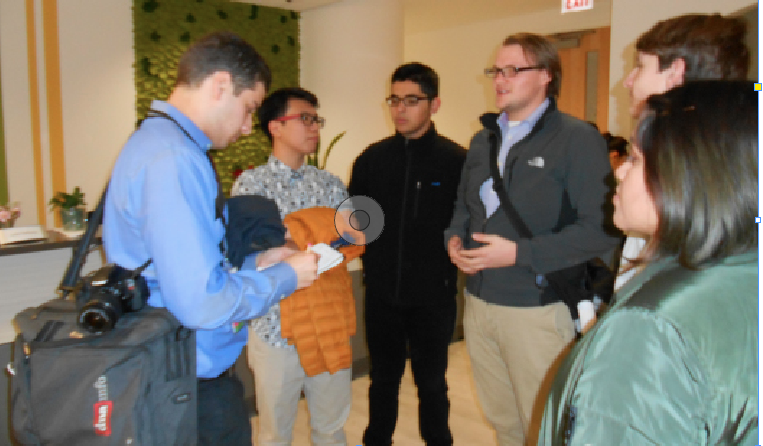 Villegas and this reporter spoke at the Chicago Board of Education meeting on March 21, 2018. Villegas said that CPS has not reined in Taft. 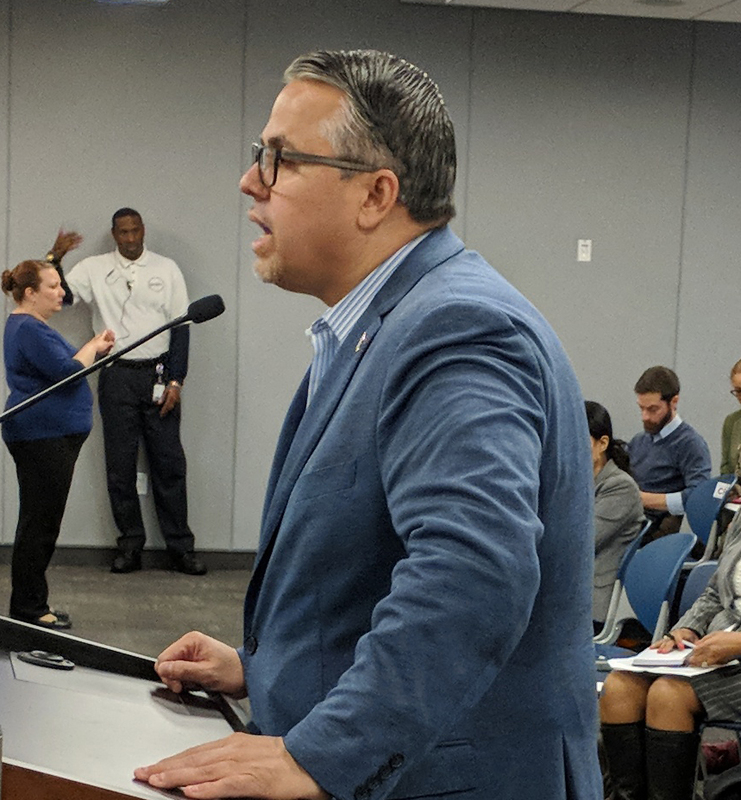 He asked the Board for an academic center at Steinmetz, which would help ease overcrowding in the Belmont Cragin elementary schools, increase enrollment at Steinmetz and help market Steinmetz. He reminded the Board and schools CEO Janice Jackson to keep all the aldermen informed. Jackson said that Chief Education Officer LaTanya McDade could meet with Villegas to explain the process of getting a 7th and 8th grade program. 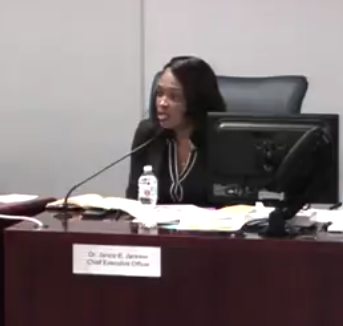 She said it “is not as easy as people think.” She said CPS looks at demographics and “choice patterns.” She also said that CPS would provide enrollment numbers to him quickly. In my presentation, I said it was crazy, harmful, wasteful and racist for CPS to build another school on the northwest side. Steinmetz teacher (and Substance reporter) Sharon Schmidt speaks against the CPS plan to build a new school at the Board of Education meeting on March 21. Jackson did not respond to the charges of racism or wasting money, and she downplayed the harm that the new school would cause. Instead, she put the burden of increasing enrollment at Steinmetz on Steinmetz. “The focus, as Alderman Villegas pointed out, should be on how do we improve the programming and support at the school to attract more students to the school,” she said. Her statement echoed what Dispensa said at the Steinmetz Feb. 8, 2017, LSC meeting. After explaining that CPS would remove Dunning from the neighborhood attendance area, he called it a “good opportunity” for Steinmetz to look for more students in Belmont Cragen. While LSC members, Ald. Villegas, Principal Ngo, students, teachers and community members accused Dispensa of being disingenuous and not listening to Steinmetz concerns, he said he was just presenting data. In his role as CPS spokesperson on the issue at school meetings and at the Public Building Commission meeting, Dispensa continues to not just present data in his statements, but to assert which neighborhoods deserve construction money and which ones need to make more effort. CPS administrator Jimm Dispensa speaks at the Steinmetz LSC meeting, Feb. 8, 2017. He said that losing three feeder schools was a "good opportunity" for Steinmetz to look for students in Belmont Cragin who don't attend the school. Photo by Steven Nunez. "Boundaries aren't deciding where students are going to school — parents decide that," Dispensa said, quoted by DNAinfo. "Boundary is not destiny ... so I would encourage us to think about what it takes to strengthen Steinmetz's attraction." CPS spokesman Michael Passman defended the plan to build a new school in a statement quoted by DNAinfo, saying officials "believe there is an opportunity to improve access to resources at Taft while maintaining a healthy student population at Steinmetz." "As this process moves forward, we will work with both school communities to ensure a long-term plan is in place to effectively support both schools," the statement continued. In the year that has passed, no plan has been made to "support Steinmetz" or create a "healthy student population" at Steinmetz. CPS continues to deemphasize the harm it will inflict on Steinmetz by reducing its attendance boundaries. “It’s my understanding that, and I don’t have the numbers in front of me, but that a very small number of students from those feeder schools currently attend Steinmetz,” Jackson said at the Board of Education meeting on March 21. Steinmetz community members know that losing so many students, including almost all its white and Asian students, will hurt the school. And it's obvious that there is no equity, much less equality, in CPS spending between predominately white and predominately Hispanic neighborhoods. “It’s a case of haves and have nots,” Steinmetz parent William Fleischer said of the plan, at the Taft LSC meeting in February 2017. CPS officials insist that CPS is investing in Steinmetz. Sharon, great story. It breaks my heart to read what is going on with our school. Steinmetz is a great school and historic building that needs to be maintained. It wasn't but a few years back when the school's halls were wall to wall full of students of all races, 2500 approximately. It is still thriving but with the building of a new school by Taft it will mean that Steinmetz may suffer the consequences. Very sad to see that segregation and racism continue to exist even now in 2018. Hear, hear on this piece -- very good work. thank you for this in depth piece on the issue.